Here’s what seems reasonable to say: the facts on just who might have been the NHL’s first Indigenous player are unsettled. I wrote about this back in December, here, but it bears reviewing. 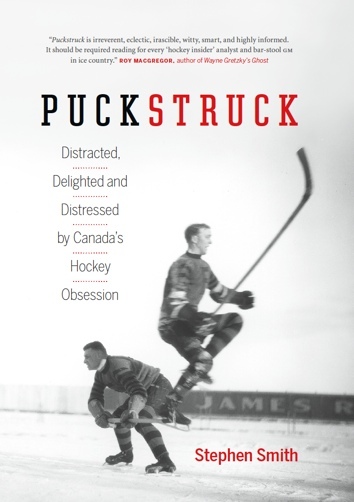 The record on whether Paul Jacobs actually skated for Toronto in 1918 is — murky. What about Taffy Abel of the Chicago Black Hawks in the 1920s? Not so clear. I’m not the only one who’d say the strongest case would seem to be that of Buddy Maracle, who played for the New York Rangers in 1931. Jim Jamieson, also a Ranger, would seem to have come next, in 1944. Which gets us to Sasakamoose. There’s no disrespect for what he’s achieved in his career in the suggestion that he’s probably the third Indigenous player to have skated in the NHL. So why hasn’t the NHL gotten around to acknowledging this? This isn’t new news. It’s been discussed before. Not by the NHL, pointedly — the league shows no interest the history beyond the version they’ve settled on. No interest, at least, in disturbing the history that seems to have served just fine since Sasakamoose was actually in the league. No-one was acknowledging Maracle and Jamieson in the 1950s, let alone telling their stories — they’d already been forgotten. Sasakamoose gets a second call to the NHL, in February of 1954. The silencing and erasure of Indigenous stories is, of course, another not-new Canadian story. Sasakamoose was only briefly an NHLer in the 1950s, and whatever currency his story had in the mainstream press in Canada and the United States at the time was couched in stereotypes, assumptions, and casual racism. That his story is being told now, frankly and in fuller frame, with all the pain and ugliness of his experience at residential school, is a greater good. (See, in particular, Marty Klinkenberg’s powerful 2016 Globe and Mail profile.) But what about acknowledging the other Indigenous NHLers who went before? Why is this so hard? In late December, when Sasakamoose was named a Member of the Order of Canada, he was on the ice at Edmonton’s Rogers Place to preside over a ceremonial face-off ahead of a game with the Chicago Blackhawks. As far as we know, Sasakamoose was the first Canadian Indigenous player with ties to First Nations. Since we don’t track race/ethnicity, we rely on archives/online stories, and information from the players themselves. In Canada there are lots of communities with ties to First Nations — it’s possible there was a player with Indigenous parents that played before Sasakamoose, but there’s no way to know for sure. Same again earlier in the week, via the league’s own editorial arm, NHL.com, where Tom Gulitti was still, in a prominent Sasakamoose profile, putting him ahead of any others. I tweeted a note to Gulitti, with a link to my Maracle story, but didn’t hear back. Along with several other writers, elsewhere, Gulitti also touted this week as the anniversary of Sasakamoose’s NHL debut, in 1954. (Klinkenberg mentions ’54, too.) Quibblesome as it’s going to sound, that’s not right, either. It’s true that Sasakamoose, rookie centreman, was in the line-up for Chicago when they played in Toronto on February 27 of ’54. But he’d already been called up from the minors earlier that season, in November of ’53. The chief is only 18 and plans to play junior hockey with Moose Jaw, Saskatchewan, where he will be listed in the program as Fred Sasakamoose. … He is a full blooded Cree and as such collects $5 a month from the Canadian government under the ancient peace treaty with the tribe. … Sasakamoose, or Running Deer, is 5 feet 11 inches tall, weighs 165 pounds, a fast centre, and ambidextrous. … Gordie Howe of the Detroit Red Wings is the only ambidextrous player in the National Hockey League at the moment and experts say he does not operate as smoothly as Sasakamoose, or Running Deer. Chicago coach Sid Abel was said to have high hopes for him when he put him into the line-up on the Friday, at home against Boston. The Tribune said he “gave a spirited account of himself,” showing “a pleasing willingness to rough it up” in Chicago’s 2-0 loss, firing “two or three good shots” on the Bruins’ Sugar Jim Henry. For Sunday’s game, home again to Toronto, Abel put him on a line with veterans Bill Mosienko and George Gee. He didn’t really feature as the Leafs prevailed 5-1 — or if he did, the Chicago papers didn’t take notice. 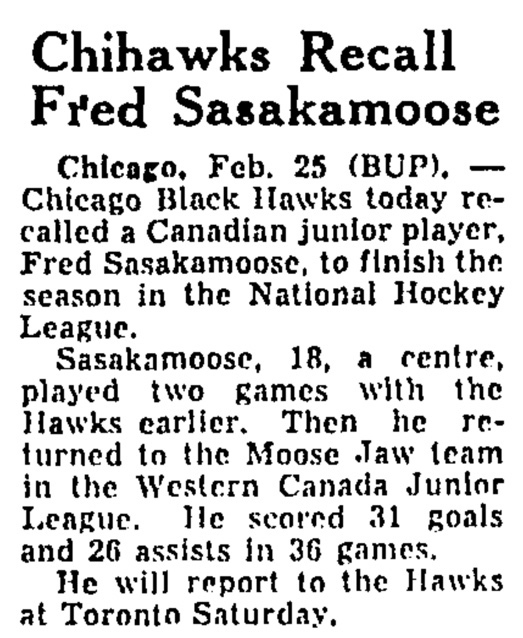 They did mention that next morning, Monday, the Hawks sent him down: Tiny Thompson took Sasakamoose back to Moose Jaw, where he’d play through until the next call-up, in February.